The Alabama special election primary was held Tuesday, bringing us closer to the outcome of 2017's final special election - which has more characters and unexpected twists than a mystery novel. That includes a timely tie to the other major political event Tuesday - President Trump's irate press conference in which he expressed sympathy for white supremists who led the deadly riot in Charlottesville. It also provides Democrats with the first hope of taking the Senate seat that beleaguered Attorney General Jeff Sessions, also in the Trump spotlight, held for 20 years. Democratic frontrunner Doug Jones handily beat out seven other primary challengers, with a sweeping 65.6% of the vote. 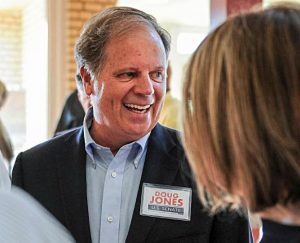 Jones first made his name as a Clinton-era US Attorney who, in 1998, re-opened and successfully prosecuted two Klansmen for the deaths of four little girls killed in the 1963 Birmingham church bombings case. 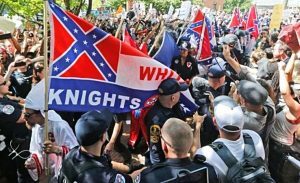 With his unique role in the history of the civil rights movement, Jones has an opportunity to capitalize on the public outrage over Trump's defense of the "alt right" protestors and their actions in Virginia. The contrast to the GOP is further underscored by the final two Republican candidates, who have their own unique credentials. 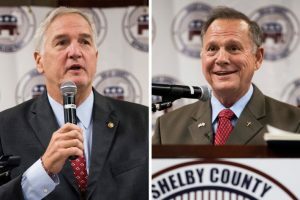 In Tuesday's Republican primary, former Alabama Chief Justice Roy Moore secured 38.9% to 32.8% for interim US Senator and former Alabama Attorney General Luther Strange. Congressman Mo Brooks came in third at 19.7%, ahead of the seven remaining primary candidates. Since no candidate secured 50%+ of the vote, the top two vote-getters advance to a September 26th run-off. Republicans Luther Strange and Roy Moore will go to a run-off September 26th. Moore, the favorite of conservatives, first earned public attention as a county judge in the 1990s when he hung a plague of the Ten Commandments on his courtroom wall. In 2000 he won a race for the Chief Justice of the State's Supreme Court, but was removed after he famously refused to remove a 5,280-pound granite Ten Commandments monument from the rotunda of the state judicial building. Moore ran successfully for Chief Justice again in 2012, but was suspended after directing probate judges not to issue marriage certificates to gay couples. Following an unsuccessful appeal, Moore resigned in April 2017. Strange was serving as the State Attorney General when he was tapped in February to temporarily fill Sessions' Senate. The establishment candidate, Strange received the then-welcome endorsement of President Trump, who won the state with 62.1% of the vote in the 2016 Presidential, and the support of political groups allied with Senate Majority Leader Mitch McConnell. Strange is expected to get Brook's support, as well as that of several of the other primary contenders. The match also sets up what is expected to be a bloody run-off battle, which could drain the GOP's resources going into the December 12th general election. Prior to Sessions, who was elected in 1996, the Senate seat was held by Howell T. Heflin, a conservative Democrat, for three terms. Alabama's other Senate seat is held by Richard Shelby (R), who was elected in 1986 as a Democrat, then switched parties in 1994 after the "Republican Revolution" that swept Congress. 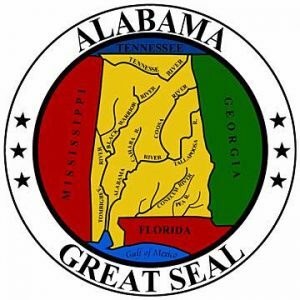 The state's seven Congressional Districts are held by: Bradley Byrne (R-01), Martha Roby (R-02), Mike Rogers (R-03), Robert Aderholt (R-04), Mo Brooks (R-05), Gary Palmer (R-06), and the lone Democrat, Terri Sewell (D-07). It is unclear how current - and no doubt ongoing - national developments will affect the final outcome in December but, for now, it is the race to watch! As always, DemList will keep you informed. Help DemList with a Contribution Here Today!